https://matcha-jp.com/en/6789 4 Must-Try Gourmet Japanese Beef Dishes At Sendai's Kisuke! 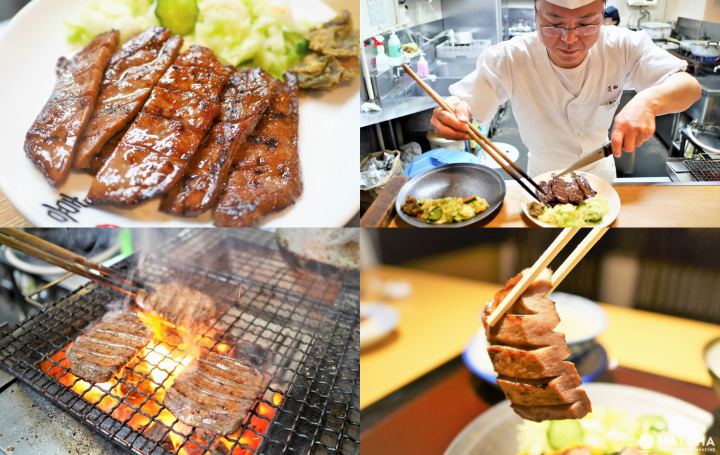 4 Must-Try Gourmet Japanese Beef Dishes At Sendai's Kisuke! Sendai City in Miyagi Prefecture is where delicious gyutan (beef tongue) meal was first served in Japan. There are over one hundred gyutan shops in Sendai. We introduce our recommendations at Kisuke, a restaurant that has been operating since 1975. Sendai City in Miyagi Prefecture is a popular travel destination in the Tohoku region. The city is especially known as being the birthplace of the gyutan grill. Gyutan is the tongue part of beef that was formally discarded until late World War II due to cooking limitations. However, one day, a Japanese chef from Sendai tasted the beef tongue stew at a restaurant and was astonished by the delicious taste. They began to wonder if they could use gyutan in other dishes. They grilled the gyutan and paired it with rice and soup, creating the gyutan teishoku (gyutan set meal). The dish became popular in Sendai and now the gyutan teishoku meal can be eaten throughout many restaurants in Japan. Gyutan teishoku consists of four parts: grilled beef tongue, barley rice, tail soup, and oshinko (*1). The tail soup uses broth from the beef tail. Since white rice used to be expensive, barley rice was served instead. The cost was reduced by adding seasonal vegetables as pickles as a side. This was the ultimate form of an inexpensive and delicious meal. *1 oshinko: Vegetables left to pickle in seasoning over a period of time. These pickles are light, so they are used as a side dish for ingredients with a bold flavor. The oshinko pickles vary depending on the Kisuke branch. Sendai City has nearly a hundred shops that offer gyutan teishoku. We visited Aji no Gyutan Kisuke, a restaurant that has been open since 1975. Kisuke employes skilled chefs who carefully season the meat and emphasizes thorough quality control. Skilled chefs hand-season the meat daily at the factory. The simple flips of the wrist to add a dash of salt vary according to the chef's physical control. Therefore, the head chef must check the taste every day. Only the beef tongue that passes these harsh checks are delivered to the Kisuke locations throughout Japan. After passing the quality control at the factories and headquarters, the managers and co-managers actually grill the meat to check the flavor daily even after the delivery. If they are not satisfied, the meat gets returned. The meat is offered to customers only once it clears these taste checks. We observed how the manager grilled the meat. The cooking methods vary according to the lean and fatty parts of the same meat. Controlling the temperature and timing the turn on the grill bring out the flavor of the meat to its best condition. We asked how they time the flipping of the gyutan and he replied "when it looks right." He appeared as if he was referring to an expression of a person. You can see the care behind each piece of meat. High-quality gyutan is the standard at Kisuke. Even if it gets cold, the gyutan does not get hard. They also want their customers to leave satisfied, so they include a generous helping of pickles. Each dish on the menu has been created using the techniques that have been passed down for many years. We will introduce you some of their best items! The dish first-time visitors to Kisuke should try is the classic Char-Grilled Gyutan (3 pieces/6 slices) meal (1,674 yen with tax.) It is the most recommended dish and you can taste the flavors of the gyutan right off the bat. This deliciously-addictive dish has a nice texture and savory flavor. When ordering, you can select either salt, miso, or sauce flavors. The sauce is made using a special house recipe. The salt is the classic, but we recommend the sauce if you want to taste Kisuke's original flavored gyutan. For visitors who wish to enjoy the texture this meat, choose the special thick-cut gyutan (3 pieces/6 slices) meal (2,484 yen with tax.) The thick slices of gyutan are chewy and the texture is amazing. Only a limited amount is available in the salt flavor. Once you indulge in a piece of gyutan by itself, try the second slice with shichimi togarashi (*2) pepper. The flavor will change and you can enjoy a different taste. If you like spicy food, wrap some miso namban (pickled green chili peppers in miso) around the gyutan. The spicy miso namban will add a nice kick to your meat. *2 Shichimi togarashi: A Japanese spice blend consisting of chili peppers, Sichuan pepper, herbs, and spices. Cooked in this special oxtail soup, the thickly-cut gyutan becomes so soft that you can cut it with your chopsticks. With a light flavor, the black pepper and wasabi adds a nice spicy taste. It is delicious even when it's cold, so it is worth a try when visiting Kisuke. It is 1,188 yen with tax. This is tofu dish is topped with ginger juice, mirin (*3), soy sauce mixed with minced gyutan. The sauce is is cooked until it becomes thick. The completed an (*4) sauce is topped on hot tofu (*5). The gyutan has an interesting firm texture and goes well with the fragrance of green onions. It costs 270 yen with tax. *3 Mirin: A type of seasoning made out of shochu, steamed sticky rice, and malted rice. *4 An: A thickened sauce topping made with soup mixed with potato starch. *5 Tofu: A processed food made out of soy beans. The Tappuri Gyutan Stew Set comes with barley rice and salad (1,188 yen with tax.) The big chunks of gyutan is in a bowl filled with the sauce from the stew. You have to bite into the large pieces, but the meat is very tender. You can also order just the Tappuri Gyutan Stew alone for 1,080 yen with tax. This is a good dish for visitors who are not accustomed to Japanese dishes. Trying delicious alcoholic drinks is part of the fun of travel for many people. At Kisuke, they offer Japanese sake that goes well with gyutan. Kore Zeppin (1,026 yen with tax) is a Japanese sake that was specifically made to pair with gyutan. It is fruity and has a light aftertaste. The Koganezawa (810 yen with tax) is a local Miyagi sake that has a Kisuke label on it. After just one sip you will taste its bold sweetness, but it has a refreshing aftertaste. It is recommended to try with the gyutan as well. If you liked the dishes you had at the shop, why not take some back with you? The oxtail soup (648 yen with tax), Tappuri Gyutan Stew (864 yen with tax), Tappuri Gyutan Curry (864 yen with tax) can be bought as packaged instant foods. Frozen gyutan, Shokunin Jikomi Gyutan, is also sold for 1,620 yen with tax for 110 grams. Kisuke has branches in Tokyo, Kanagawa Prefecture, Osaka, and Nagoya. However, the main shop is in Sendai. This time, we went to the Jozenji location. The Jozenji restaurant has table seats, counter seats, and private rooms. It is a shop that you can enjoy alone, or with friends or family for any occasion. Along with the Jozenji branch, other locations also have menus in English, Simplified Chinese, Traditional Chinese, and Korean. If you wish to see a menu in any of those languages, please ask the staff. There are seven branches in Sendai City. The Ichibancho Main Branch was featured in the 2017 Miyagi edition Michelin Guide. There's also the S-PAL branch connected to Sendai Station, the JR Sendai Station branch within the Gyutan street in the station, and the Gyutan Kappo Kisuke Annex that serves other Japanese dishes along with gyutan. Juicy gyutan is exquisite on its own, but you can enjoy it even more after learning about the passion of the chefs wanting to deliver a satisfying dining experience to consumers. At Kisuke, you can savor the delicious flavors along with the dedication those who create it. Fixed holidays New Year's Day and other unspecified holidays. In cooperation with Kisuke co.; Ltd.
Great Regional Dishes Near Tokyo Station - Don't Miss Them!